Superman is America. He stands as a symbol of hope and patriotism, and, if director Zack Snyder is to be believed (which I do), the Superman S is the second most recognizable symbol in the world, just after the Christian cross. As if that wasn’t enough, Superman has too many powers. 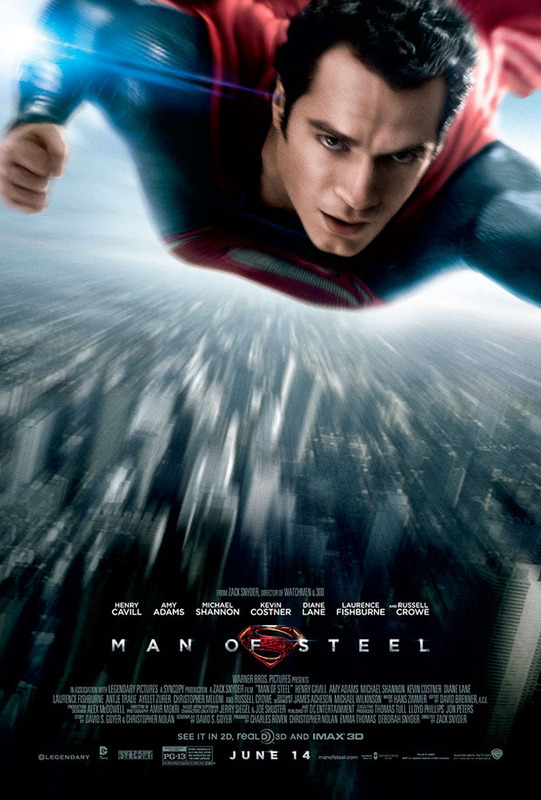 By the time Richard Donner, the director of the original Superman films, was done with him, Superman was out right invincible, prompting Bryan Singer (the director of the 2006 mockery, Superman Returns) to force a situation where Lex Luthor (Kevin Spacey in that movie) tried to build an entire continent out of Kryptonite. In short, reinventing the Man of Steel is no easy feat. Somehow though, Snyder and writers David S. Goyer and Christopher Nolan (of the stunning Dark Knight trilogy) have managed to do just that. 1) Villain choice – General Zod (Michael Shannon) and his followers are actually stronger than Superman. I can happily report that I didn’t think there would be a way out. In addition, since Zod is of Kryptonian descent, Superman can delve further into his past and gives us a fantastic opening to the film (see point number 2). 2) The Sci-Fi Epic – Instead of beginning the story as Donner did with the Kent family finding Kal-El after simply being thrust into space, Goyer & Nolan have written an epic space opera spanning approximately twenty minutes that stars Jor-El (Russel Crowe) as he attempts to save his son before Krypton explodes, while at the same time, dealing with a military coup by Zod. Simultaniously, we are informed that Kryptonians have not had a natural birth in centuries (think Children of Men) and babies are stored in a giant pool (reminiscent of The Matrix), getting their purpose in life directed to them by the codex, which is inexplicably shown as a skull. This sets up the plot of the story on Earth beautifully. 3) Flashbacks – Where most people would think to tell this story chronologically, Christopher Nolan (who has experience dealing with complex ways of using time, such as Memento, Following, and Inception) thought to jump right from a Kryptonian firing brigade to a twenty-something superman on a Crab fishing boat á la Deadliest Catch. Then, they proceeded to gradually add more information about Superman’s past, such as his mother, Martha Kent (Diane Lane), hugging him after a brilliant bout with the side effects of x-ray vision that doesn’t have to do with seeing up girls’ skirts, and a bit about a tornado, where his father, Jonathan (Kevin Costner), risks certain death trying to protect the identity of his alien son. 4) Superman as a Loner – They simply did the right thing by making Superman a loner. He’s an alien who can do things other people can’t. It only makes sense that he’d feel like an outcast. Henry Cavill, who did a fine job as the caped crusader, had a bit of difficulty trying to transition from an all-American hero to a mysterious dark figure, but that’s because he’s not. He’s too good to be a Nolan’s Batman (Christian Bale). He’s too powerful to be ominous. 5) Casting – In addition to Cavill, Shannon, Lane, and Lawrence Fishburne (who played Perry White, the editor-in-chief of The Daily Planet), who upset no one in their roles, the film featured three great actors. The first being Costner, who was given a descent, borderline sappy role, and turned it into something he can proud of (“You are my son!”). Lois Lane was finally played by a great actress: Amy Adams. Appearently, she’d been trying to play Lois Lane for quite some time now, and she certainly made it a memorable role. It also helped that they explained why the villain cares about her at all and that, unlike in the Donner films, she was a hero, herself, not just a damsel-in-distress. However, the stand-out for me, and maybe it was just because I thought he was cool, was Crowe, who had to fill the formidable shoes left in the ‘70’s by Marlon Brando, who was, at the time, the closest thing we had to God. However, Crowe was able to do it thanks to the aforementioned opening and an incredibly inventive way of communicating via the a tool he had given to the infant Kal-El, which was very similar to how Superman received knowledge from his father in the Fortress of solitude. Luckily, this time, it didn’t involve our hero rummaging through an assortment of crystals to get the right message. It also allowed his ghost/image (it’s hard to explain) to communicate not only with his son, but also with Lois and Zod. In fact, the film featured a fantastic chase scene that involved him and Adams escaping Zod’s spaceship in dramatic fashion. 6) The suit – the underwear was on the inside and it didn’t require a cutaway to Superman taking sewing lessons. 7) The ways he learns about his powers and people’s reactions – I won’t give that away. Nonetheless, the film was not perfect. It had more than a few flaws. 1) There were too many fight scenes/action sequences. 2) The Zod part of the story reached its climax (which was admittedly entertaining) about 10 minutes too soon. 3) How do the breathers break? It was inconsistent. 4) There was no reason that the codec should be shaped like a skull which I just found odd. Overall though, the film was very good. Snyder did a very good job at reaching a mass audience (I wanted to see more of Snyder’s quintessential slo-mo shots, though most people probably wouldn’t.) The Superman mythos underwent massive changes (at least, in the eyes of the average viewer) and yet no one got mad. And, yes. The visual effects were absolutely stunning. From the dinosaur-like creature at the film’s opening, to Zod’s ruination of Union station and everything in between.